Borax powder is a safe alternative from using chemicals to clean your home. Borax is a good stain remover and is used as a deodorizer as well. This combination makes it perfect for cleaning a toilet. Borax powder is a natural mineral and is an alkaline substance. Borax does not produce fumes and makes for a good cleaner for those with asthma or other lung problems. However, it is harmful if swallowed or if it gets into the eyes. Flush the toilet to get the sides wet. Sprinkle borax around the toilet, pouring more on the stained areas of the toilet. Spray the vinegar over the areas you layered with borax. Do not spray enough to wash the borax away, just enough to create a thin paste. Allow the mixture to set overnight. Scrub the stain away with a toilet brush. Create a mixture by pouring borax and lemon juice into a bowl. A cup of borax and ¼ cup of lemon juice would be a good starting point. Mix the two ingredients together until a thick paste is formed. Add more lemon juice or borax as needed to create the paste. 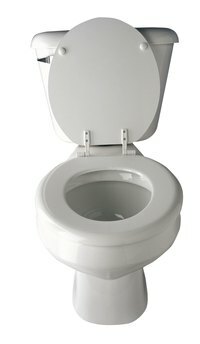 Enough paste should be created to cover the entire ring of the toilet bowl, or the stain you want to remove. Apply the paste to the stained areas, or around the entire ring. Allow the paste to set for at least two hours and then scrub the stain away with a toilet brush. How Can I Make Homemade Borax?